Hold an open Bible. Explain that the Bible is God's Word and it is true. Have a child read II Peter 1:21 aloud from the Bible. Say it together in unison. Then lead your students in saying the following poem together. Of God’s love (point to your heart)? My Father (point to self) up above (point up). (form cross with fingers, then point to heart). That shows the way to walk (walk fingers up arm). (fold hands to pray, and bow head). Say, The Bible tells us that God loves us. He has always loved us, and He has always wanted to tell us so. A long, long time ago God spoke in many ways to tell about His love for us. Sometimes He spoke through men called prophets. 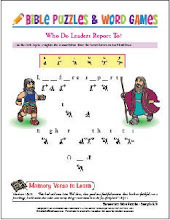 They and others (such as King David) wrote down what God wanted everyone to know. And sometimes God talked to people directly, telling them little by little about His plans. Then when Jesus came down from heaven to be born on earth, God spoke to us through Him. God’s Son, Jesus, brought us the message of God’s love.